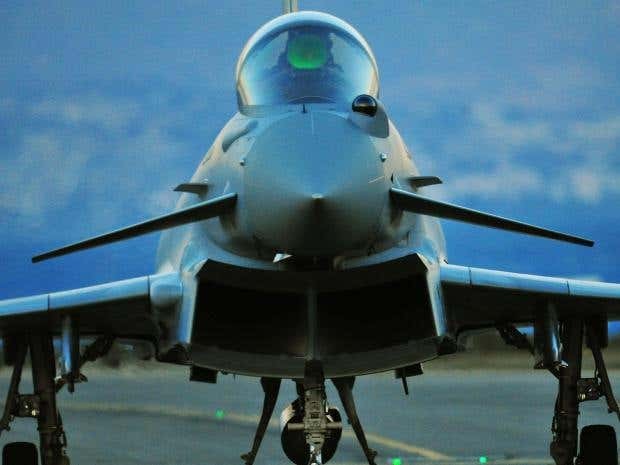 RAF Typhoon jet fighters are set to be deployed to Romania to beef up defence around the Black Sea and “provide reassurance to allies”, according to Defence Secretary Sir Michael Fallon. Four of the aircraft from 43 (Fighter) Squadron will lead the deployment, joining Nato's southern air policing mission, he said. He also confirmed UK investment in developing cyber warfare capabilities and skills – including the ability to launch online attacks. The Typhoons, from RAF Coningsby in Lincolnshire, will spend up to four months based at the Mihail Kogalniceanu Air Base in south east Romania, policing the skies over the Black Sea alongside local jets. It follows the deployment of the first of UK troops to Estonia last week as part of Nato’s plan to deter Russian aggression in the Baltic. Some 120 soldiers from 5th Battalion The Rifles landed at the Amari air base, 25 miles south-west of the capital Tallinn. Other Nato members, such as the US, have also deployed troops and military resources to other vulnerable former Iron Curtain states. Sir Michael said: "The UK is stepping up its support for Nato's collective defence from the north to the south of the alliance. With this deployment, RAF planes will be ready to secure Nato airspace and provide reassurance to our allies in the Black Sea region." In a wide-ranging speech at the international parliamentary conference on national security, Sir Michael said an already-announced £1.9 billion investment in cyber security would help develop skills and capabilities across government. He said: "Our military is among the best prepared in the world to tackle cyber threats with capabilities and skills integrated into the Army, Royal Navy, and the RAF. But in such a dynamic environment we must continually test and enhance our skills. "We're interested not just in defensive but also in offensive cyber, those who threaten cyber-attacks against us need to know the risk they're running." The move comes after Nato announced plans to spend its €3bn (£2.6bn) on upgrading its satellite and computer technology in acknowledgement that conflicts are increasingly fought out online rather than in the air, on land or at sea. The plans will include a €1.7bn (£1.5bn) investment in satellite communications to better support troops and ships deployed across the alliance, as well as aiding the use of drones and €71m (£61m) on improving the protection of Nato’s 32 main locations from cyber attacks.